Canon’s SX range of travel compact cameras have long been popular, and with merit because they’ve been well crafted. 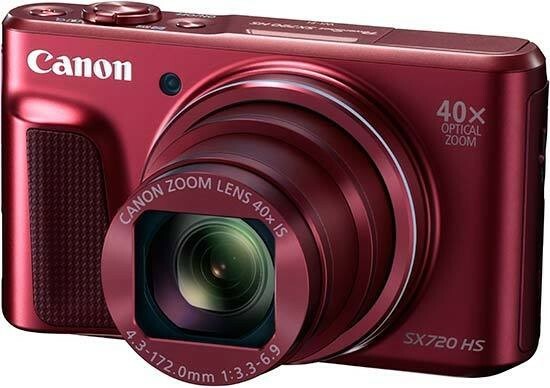 The Canon PowerShot SX720 HS continues that tradition, housing a market-leading 40x optical zoom in a slim and sleek body design, which is ideal for those who are travelling, holidaying, or just looking for something which they can use for day trips and every day usage. It has full manual control which is great news for enthusiasts - but it would be nice if that control extended further to include being able to set the autofocus point, and to shoot in raw format, as you can with something like the Panasonic TZ80. There’s in-built Wi-Fi, which is useful for transferring your shots, or remotely controlling the camera for group and self portraits. That makes up for the lack of a tilting or articulating screen, since you can shoot awkward angles via your phone if you need to. It’s a shame not to see a touch sensitive screen, when other Canon cameras have such great touch control, but it perhaps helps keep the cost of the SX720 down. All that aside, when it comes to the most important thing - image quality - JPEGs from the Canon PowerShot SX720 HS are very good. Colours are bright and punchy, while low light shooting up to around ISO 1600 yields good results. Detail is a little smudgier at ISO 3200, but if you’re only likely to be sharing online, or printing at small sizes, it delivers well. Hybrid Auto and Creative Shot are fun modes which are great to use, but again, could do with a little more control to be even more appealing. As it stands, the Canon PowerShot SX720 HS is cheaper than Panasonic’s TZ80. While you don’t get raw format shooting, you do get a significantly longer zoom (40x vs 30x) and the JPEG image quality is better than that of the Panasonic’s so it represents great value at the moment. Overall, Canon has produced an excellent travel zoom in the PowerShot SX720 HS, which is capable in a number of different shooting conditions and would be an excellent companion for most holidaying photographers - there’s still room for improvement though.